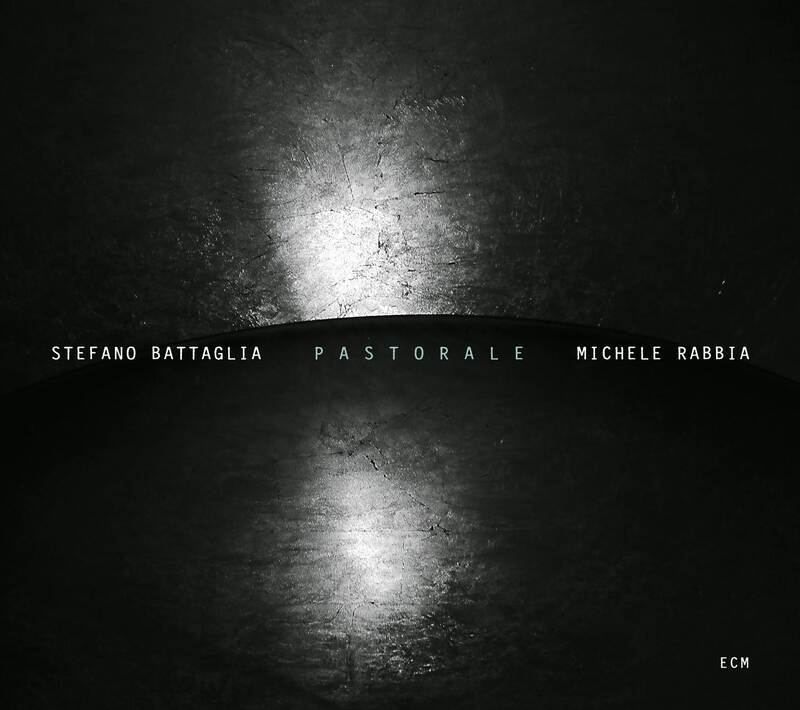 An album of piano and percussion duets may seem unusual, but, by the time of this recording, pianist Stefano Battaglia had been playing with the form for well over a decade. With Michele Rabbia he has spun a core thread, but always in the tapestries of his ensemble projects. With the release of Pastorale, that thread blossoms into a quilt of its own making. Most fascinating about the duo, in this context, is a mutual willingness to expand their sound into digitally enhanced territories. Coincidentally or not, Rabbia’s organic electronics haunt only the religiously titled tracks. “Monasterium” walks a tightrope between light and dark toward a perfect balance of the two in a way demonstrated also by the album as a whole. The mesh of foregrounded piano and metallic overlay in “Oracle” hints at a wealth of introspection in the distance, visible but unreachable. “Spirits of Myths” furthers this marriage of the living dark, burning low, muted preparations of the piano in the sun and sparkle of Rabbia’s circuitry, conferring a shared inner core as Battaglia and Rabbia become distortions of themselves. Over time, they seek reflection in dialogues between light and metallic surfaces: the clasp of an old Bible; a doorknob polished by decades of turning; a ring that, once worn, is never taken off. By contrast, the atmosphere of “Kursk Requiem” is thick and submarine. The piano marks the procession of technological voices in high-pitched feedback whispers, looping even as they fragment. Even the album’s opening “Antifona libera” (dedicated to Enzo Bianchi, Prior of the Monastic Community of Bose in northern Italy) with its resonance hints at a mercy as resolute as it is mysterious. On that note, the track “Metaphysical Consolations” might just as well have yielded the album’s title, for it best describes the processes of communication it entails. As it stands, the actual title track practices more than it preaches. Its prepared piano nets drums and gongs, rumbling and singing by turns, seeking flesh through abstraction and in that flesh a feeling of divine order. In this instance alone, it seems, Battaglia’s dissonance is more an expression of tactility than of distortion, giving the ears purchase in a crumbling scene, his right hand the insistent traveler whose map grows with each fearless step. In similar exploratory spirit, the duo mines folk veins in the smoother, jazzier “Candtar del alma” and the modally inflected “Sundance in Balkh.” Even the fully improvised “Tanztheater,” named for the style created by its dedicatee, choreographer Pina Bausch (also the subject of a 2011 documentary by Wim Wenders), carves tunnels beneath the driven architectures above, and with them the possibility of caving in at any moment. Such proximity to destruction confers on the music an emblem of honesty that reduces the act of creation to a skeleton and composes its blood anew. Prezens marks David Torn’s return to ECM after a long hiatus since cloud about mercury. 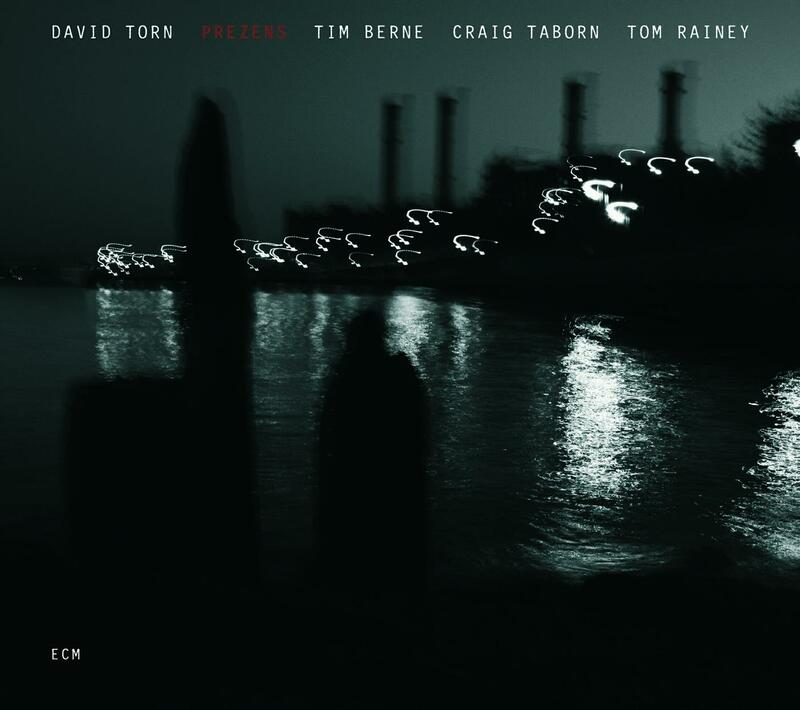 Here the guitarist joins altoist Tim Berne, keyboardist Craig Taborn, and drummer Tom Rainey for a combustible tangle of music making. The band, goes the backstory, recorded a dozen hours of free improvisation, from which were culled and refashioned an album’s worth of material, surgeried by Torn post factum. Finding one’s way through the end product may be no small task, but reaps its rewards in proportion to the openness of the ears receiving them. At sound center is Torn himself, who, if not picking his glyphs across six amplified strings, is deepening them at the mixing board. Indeed, his presence (the album’s title under another name?) echoes far beyond the chord that stretches its yawn across “ak” in a swirling electronic haze. If the appearance of drums, organ, and saxophone seems out of place in this opening track, it is because they belong there so needfully. Ambient constructions flit in and out of aural purview, foiling the physicality of the acoustic here and now. Trailing the footfalls of Berne’s ghostly doppelganger, they trip over grungy riffs from Torn, who invites satirically blissful finish. Ganglion to ganglion, each instrumental element touches the third eye of something cerebral yet instantly accessible. Accessible, yes, because of the music’s inability to clothe itself. This isn’t meant to make your head nod, but to implode. Spoken words hide like poison in “rest & unrest,” an exploration of the illusory nature of reality, a musical testimony led astray by its own shadow. It reveals the album’s variety of diction and leads into the evolved patterning of “structural functions of prezens.” As Torn’s electric keens distantly yet with the bleed-through of a Venn diagram, cells of machine-gun drumming turn this forlorn jam session into an exercise in self-destruction. Berne’s alto weaves its legato path across a landscape that is equal parts Jon Hassell and Steve Tibbetts, as if smuggling genomes across the border between consciousness and unconsciousness. So begins a chain of possible references one might connect. The electrical charge of Elliott Sharp activates the filaments of “bulbs,” while Bill Frisell’s weeds tumble through the ghost town of “them buried standing,” the latter further notable for its angelic resolution. The album’s latter half mines decidedly urban sites of sonic production. The mélange of beat and grunge that is “sink” pulses with the muffled wisdom of an underworld nightclub. Berne’s hard-hitting altoism here gives the sheen of dislocation that comes with dreams. Yet grooves are rare on Prezens, because this project is less about the hook than about the catch dangling and writhing on its barb. Despite the metallurgy of “ever more other” and “ring for endless travel,” two further rhythmic outliers, warped atmospheres prevail. By those atmospheres the music is always connected, whether in the jangly slide acoustic of “miss place, the mist…” or in the mock shredding of “transmit regardless,” so that by album’s end we find ourselves wrapped in a swan song to impetuous youth by way of looking into the maturity of an artist who with his cohorts has unearthed a timeworn stone to contemplate for decades more. Prezens is an album of inbound escapism—that is, one which enjoys getting lost in itself. Its codes come to us broken, for they speak only of that which was never whole. 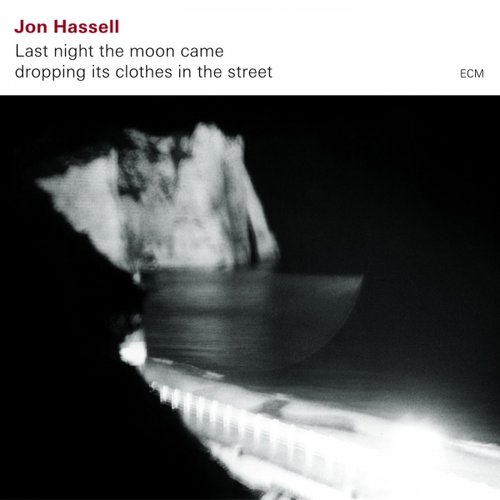 Not only does Last night the moon came dropping its clothes in the street carry the most evocative title in the ECM catalogue, it also closes a 25-year gap between trumpeter-composer Jon Hassell’s first label date, 1986’s Power Spot. About said title, one need only know it comes from the poetry of 13th-century Sufi mystic Rumi to find insight into the music it indicates. Rumi’s embodiment of spiritual evolution is, much like Hassell’s artistry, a parthenogenetic organism: it nurtures itself, grows with and through itself over time. Last night the moon came… is in many ways the ambient underbelly of Nils Petter Molvær’s Khmer and is sure to enchant fans of the same. The soupiness of his sound is in full effect here, opening to an attunement of the cosmos that uses sun flares as its ink and comet tails as is brushes—a sound honed over eons and realized through the breath of an artist whose own universalism speaks in cosmic, singing electricity. Yet the more we listen to this music, the more we realize it comes from a space within rather than without, a space found not through the telescope but through the microscope. 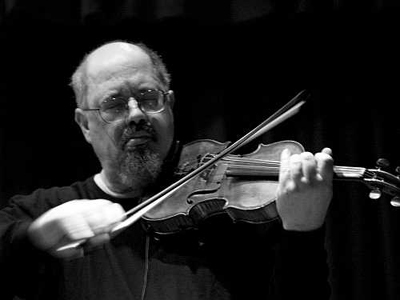 The presence of violin, for example—courtesy of Kheir Eddine M’Kachiche, whom Hassell encountered on SIWAN—is a deeply biological one. M’Kachiche’s ghostly mitochondria snake their way through an outer-to-inner progression that smoothes within earshot in the introductory “Aurora” and fades from it in the pale of “Light On Water.” At first, the trumpet is tucked safely away in some inter-dimensional pocket, making its first appearance only in the appropriately titled “Time And Place,” a fraternal tone to the violin’s sisterly wisdom. With the music’s x- and y-axes thus established, we have free fall. Balance of the unplugged and the wired, of matter and ether, continues throughout. The sense of patience is nocturnal indeed, the song of Hassell’s instrument multifaceted and luminous. The overall effect is one of perpetual exhale. Tasteful applications of instruments mark the path with cohesive memories. Sections such as “Clairvoyance” trace their development by the same clock yet spin their tails in more subterranean designs, diurnal and flowering, while the bass of “Courtrais” throbs just overhead, yielding like a suspension bridge during an earthquake. Purely descriptive moments are rare. Rather, the flow proceeds by way of feel. “Blue Period” is perhaps the closest we get to a painterly aesthetic, the height of Hassell’s reach evoking a bird of prey surveying the territory below as if it were its own body, splayed and stretched to the span of a continent. Like the drumming in the album’s concluding steps, it makes fleeting contact with land, shifting from shadow to shadow, half here and half gone. The word “atmospheric” was invented for music like this. 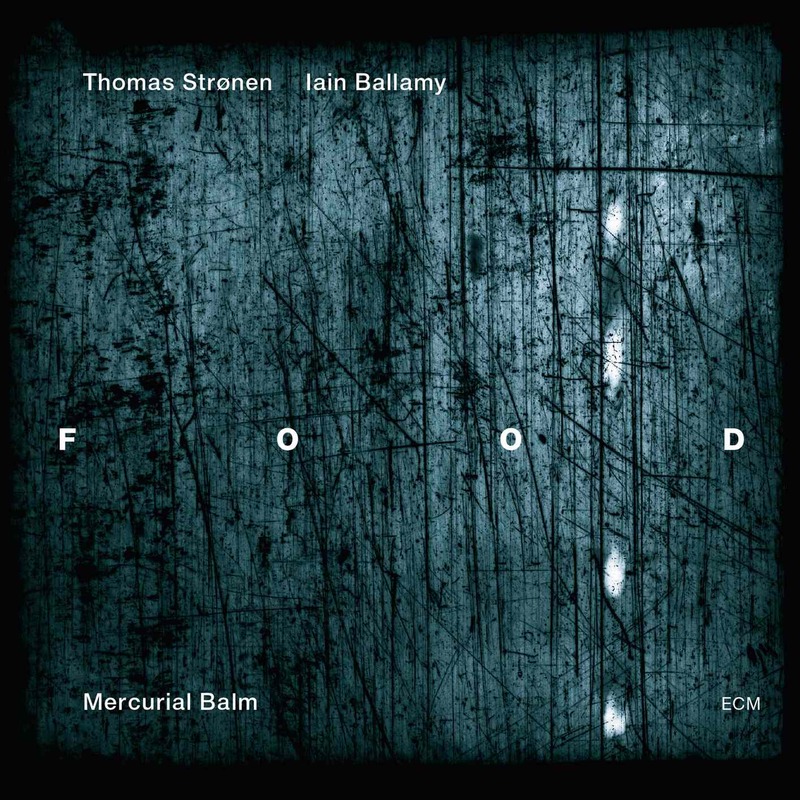 Mercurial Balm is not only the second ECM outing for saxophonist Iain Ballamy and percussionist Thomas Strønen, a.k.a. Food, but is also the continuation of an exciting new direction begun in the outfit’s Quiet Inlet. Lest these musicians get roped in by their instruments, they also bring an assortment of technology to the table to expand the possibilities of their immediate means. With trumpeter Nils Petter Molvær and electronics stalwart Christian Fennesz at their sides once again, along with new guests Prakash Sontakke on slide-guitar and vocals and Eivind Aarset (recently of Dream Logic) on guitar and electronics, their sound takes a leap of evolution. As if to drive this analogy home, the malleted gongs of “Nebular” trace the helix of a tense and creaking code, building a genetic slide for the tenor’s slow awakening. Samples of those same gongs slip in and out of earshot, blending ash and ore into the traction of “Celestial Food,” which overlays bright reed lines over a subtly propulsive beat. It is the language of travel personified, the depth of communication demonstrated, the uplift of flight conveyed. Those distant drums brush forward in a digital splash, adding contrast to Fennesz’s temperate climates in “Ascendant.” Solace need not apply, for Ballamy’s is an elemental divination, casting its oracle bones into the ether in hopes they might never land. “Phase” can therefore be seen as a living segue, wormhole into the deeper biology of “Astral.” From its percussive swamp arises a more naked guitar, its pacing humming with ancient energy. This sets off the tenor and soprano in tradeoffs of augury toward an echoing finish. “Moonpie” unravels fairytale synth textures, over which Molvær breathes his sepia song. Sontakke looses his pliable self in “Chanterelle” and in the title track. He inspires Ballamy to more extroverted heights in the former, and in the latter offsets the ticking of cymbals with spider-webbed guitar. “Magnetosphere” glows with paler fire, an aurora borealis compressed to the size of a match head and lit by the mere act of gazing upon it. Echoes of the opening gongs return and pose us for the “Galactic Roll” that ends the album with Strønen’s own magnetosphere, sparked to life with a gallery of thoughts, each hooked by a god’s pinky and sworn to shine. Glittering and tumbling like a billiard ball dropping into a black hole, it sinks without sound. In this flowing landscape there are distant footsteps. Plunging and resonant, they cry for sun, forever separated from the giants that produced them. There is in this atmosphere indeed a nourishment of which to be partaken, a diary to be coveted. Its clasp may be gold, its binding weathered, but its text is transparent and fresh. 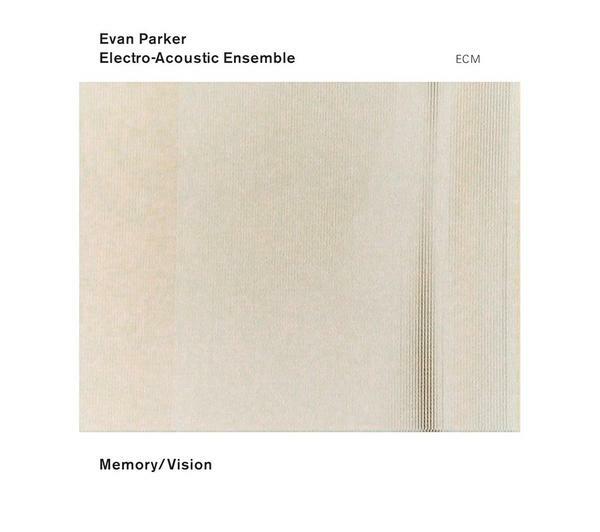 With the conviction of a fractal, this fifth ECM outing from Evan Parker’s Electro-Acoustic Ensemble unwinds in distorted, vastly interconnected replications. True to form, the ensemble welcomes three new members: trumpeter Peter Evans, reedman Ned Rothenberg (who also plays shakuhachi), and Kō Ishikawa playing the shō (Japanese mouth organ). As the growing roster (here numbering 14 members) simultaneously hones and fragments the ensemble’s dynamics, it likewise reshuffles Parker’s role as composer and bandleader in this commissioned piece for the 2007 Huddersfield Contemporary Music Festival. As with The Eleventh Hour, a wealth of intensities emerged in the rehearsal sessions leading up to the event in question, only now most of the selections are taken from behind those very scenes (only Part IV and the epilogue are live). A meticulously composed fuselage serves to enhance the spontaneity of its appendages. Part 1 introduces us to the masterful cross-referencing of signatures that distinguishes this album from its predecessors as a work of superlative control. Waterspouts of piano (Agustí Fernández), soprano saxophone (Parker), and violin (Phillipp Wachsmann) leap and drown in a roiling ocean of sonic information, from which Part 2 draws out cartographic ingredients in the effervescent soup of Rothenberg’s bass clarinet. Part 3 pales into lachrymose shades, rubbed smooth by the sandpaper of a deep-throated awareness. Its echoes are more pre than post. Part 4 strikes the expressiveness of Ishikawa’s shō like a match to wick. If ever there was darkness in these halls, it is now dispelled by holy presence. This transmogrifies into a jangling exposition in Part 5 and on to the bowed details of Part 6. In a space where siren and unfinished business can stew and percolate, its string-heavy idols pirouette at the border of gut and reason before Part 7 evinces fantastic droning depth. The album’s most nourishing morsel comes last in the form of “Incandescent Clouds,” an electronic summation of all that has preceded, spliced and held together until it fuses anew. As the most electro-centric of the EAE recordings, The Moment’s Energy embodies an exact and accomplished science. Yet no matter how technologically slanted the music becomes, it always retains an earthen quality. Interventions reveal the circuitry of life at large. Every element carries equal atomic weight. Thus it becomes the thing it never professes to be: naked sound. Like the repeated word, it sheds its associations, becomes its own entity. The birds have survived winter’s bane. Wind pulls their feathers northward. The cranes arch their necks. Let the awakening begin, they seem to say. Chickadees distort in and out of frame, radio stations at the whim of a quavering dial. The crows prune their ebony in the guise of indignation. The starlings weep electricity. Echoes of samples wound forward lift their minds while lowering their eyes. Hammers and strings convulse in riddles of expression. Ghosts become living. The analog becomes digital. There is always something of one in the other. So begins The Eleventh Hour, the fourth album by saxophonist Evan Parker’s Electro-Acoustic Ensemble for ECM. Adding to his already growing menagerie are the voices of Richard Barrett and Paul Obermayer, both remarkable composers and electronic alchemists. Their extensive databank brings a gravid feeling that such manipulations often lack. In the same vein are knob-turners Lawrence Casserley, Joel Ryan, and Walter Prati, all of whom bring so much to “Shadow Play,” the opening track described above in which their real-time modifications expand upon Parker’s multilayered soprano solo. The latter’s relative absence thereafter speaks to his appreciation for space and his ability to mark its passage without uttering a note. And while we do hear ghosts of Barry Guy in the mix, it is American bassist Adam Linson who takes the stage in his place. This vibrant record documents the 11-piece ensemble in performances commissioned by Glasgow’s Centre for Contemporary Arts, under whose auspices it developed the five-part title piece nightly for a week in early November 2004. The Parker solo is from November 3rd, the centerpiece from three days later. Part 1 begins in a flurry of zippers, catches, and locks coming undone in one glorious catharsis (then again, catharsis may not be the right word, for the end of every tunnel begins another). Violinist Phillipp Wachsmann is a prominent voice in Part 2. Jagged, cilial, and primordial, he playfully alludes to Arvo Pärt’s violin/piano version of Fratres amid a small explosion of squeals and giggles. The filaments of Part 3 wrap us in droning bliss, pianist Agustí Fernández continuing where he left off on Memory/Vision with deeply felt cartilage. The human voice (courtesy of Parker and Casserley) makes a rare EAE appearance in Part 4, adding considerable movement to the palette. Reeds crackle like logs in a settling fire, holding fast to the smoke that draws their spirit out, tendril by tendril. This leaves us with a taste of afterlife in Part 5, which glows among the embers left behind to a tune of humming sky, gilded by a veneer of high-pitched sweetness to the savory heart within. The divisions between parts seem only nominal at first, sharing as they do the same blood in their veins, but upon closer listening they reveal distinct planes to the overall shape. The mounting electronic presence this time reveals the henna-patterned hand of technology in utterly glowing ways and forges an unforgettable experience that is atmospheric to the core. Like any EAE session, this will challenge as many as it delights. Either way, it’s worth taking a chance to see which camp you’ll fall in with. Following one untouchable duo with another, producer Steve Lake and engineer Martin Pearson fly ECM’s banner into further uncharted waters. Taking the label’s exploratory spirit to heart, they bring us Some Other Season. 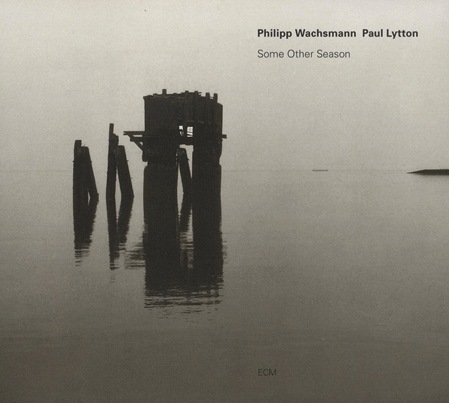 Last heard among the roaring mitochondria of Toward The Margins, here Philipp Wachsmann and Paul Lytton render that flame blue, gaseous. The two are more than experimental pioneers of their respective instruments, violin and percussion. They are, too, more than the electronic parasites that have grafted themselves so organically on to their craft. The title of “The Re(de)fining of Methods and Means” says it all: the hermetic tinkerer must splash his craft against the earth and revel in the sounds. There is treatment to be had, to be discovered in the walls, lurking among asbestos and frayed electrical wire. It is the voice of a profound past cloaked in future guise. One can almost hear fingers tapping in the interstices, flipping signatures like fuses of the brain. In “Shuffle,” the violin sheds a skin with every utterance, stirring its accoutrements with impending fury while bells and cymbals dance in the upper atmosphere. Lytton dips “Leonardo’s Spoon” into the shadow of a painted veil, and from this ladles the prompt for Wachsmann’s solo “Choisya.” Like “The Peacock’s Tale,” it finds a choir in the single string, fanned and feathered. This duo, then, is redefining at every turn, tapping the fractures of “Shell” to reveal the five-part “The Lightning Fields.” At its core is the ecstatic interaction of Field 3, which bubbles over into something like an Ikue Mori experiment in Field 4. Hereafter the session reveals its deepest biological secrets. From the thin, gurgling colors of “Whispering Chambers,” essential to what the album is (not) trying to achieve, to the final title track, which contrasts drones with the skittering vocabulary of finality, it rolls its tongue through a series of linguistic asterisks. Sounding at times a hurdy-gurdy’s dream, at others a biological nightmare, Some Other Season wafts through our aortas with the wind of Luigi Nono’s La Lontananza Nostalgica Utopica Futura and the immediacy of a London Improvisers Orchestra bonfire. A scraping and gravelly spelunk into the depths of communication, it skates along the surface of consciousness with a playfulness at once mammalian and insectile. This music is four-dimensional. One can smell it burning. 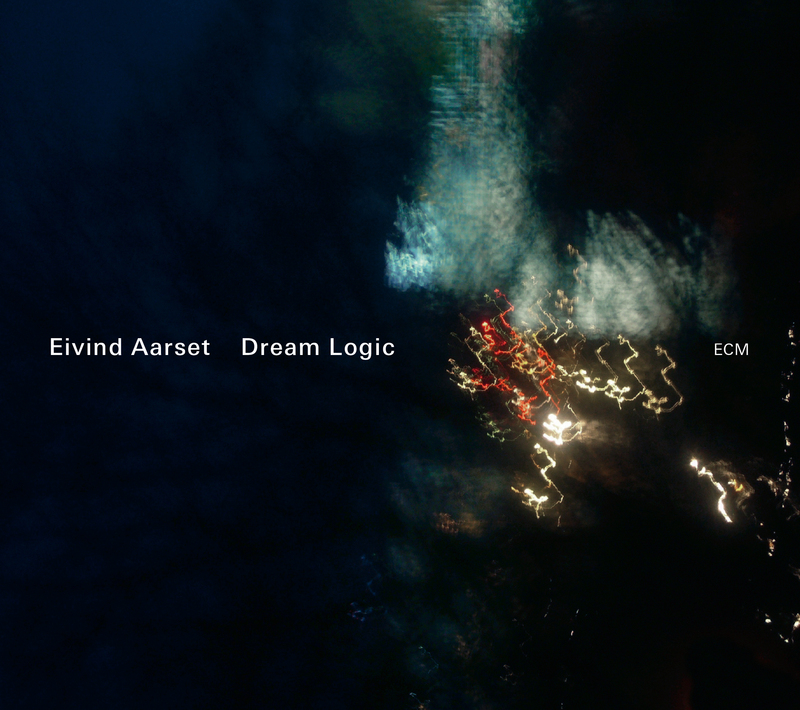 Eivind Aarset, without whom Nils Petter Molvær’s breakthrough Khmer might never have reached its full potential, gets an ECM space of his own at last. 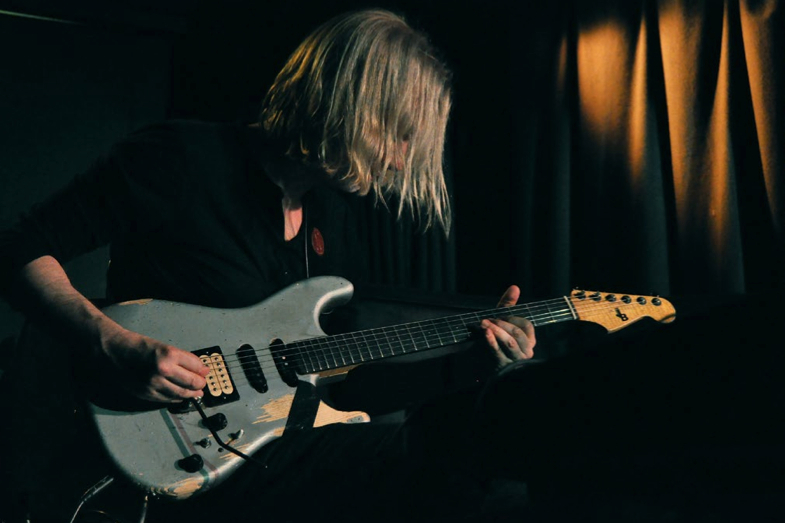 As much a child of the label as he is of Jimi Hendrix and Miles Davis, the Norwegian guitarist brings attunement to every touch of the strings. 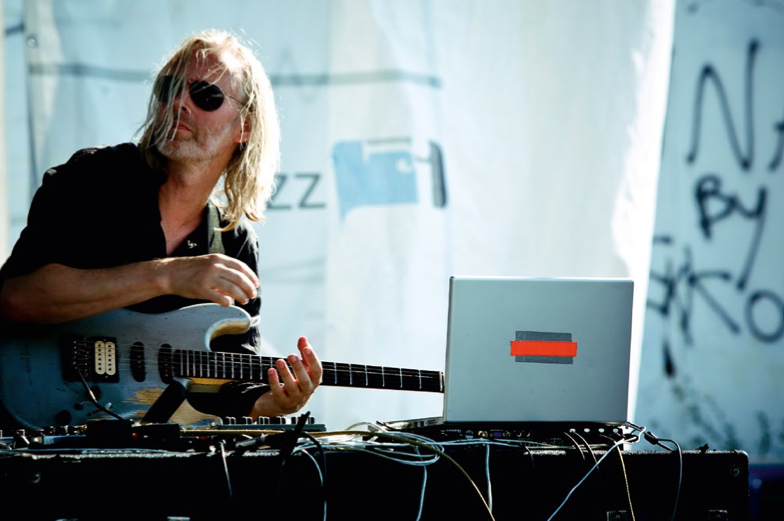 Into the synchronicity of technique and vision he has sculpted since his early teens, Aarset has absorbed inspiration from a variety of musicians, including Bill Laswell, Marilyn Mazur, and, above all, Jon Hassell. That said collaborators are all masters at creating dream logics of their own is no coincidence, for he too is the student of another time-space continuum. With guitar as writing instrument and an array of electronics as his paper, he takes down field notes of a culture we’ve never known, a culture that slides down the ladders of our DNA and airbrushes mantras onto our microbes. Partner Jan Bang—who worked alongside Aarset most recently on Hassell’s Last night the moon came dropping its clothes in the street—adds rivers and landmarks, making the overall effect that much more immediate. Given the above history, one would expect long dronescapes, à la Re: ECM, to prevail. What we get instead is a set of eleven glimpses averaging four minutes apiece. These are no scale models, but self-aware biomes along whose ghostly borders flourish colonies of samples and contact wire. In spite of the technological array in which it finds itself, the guitar of Dream Logic is naked as can be. The ensuing digital offshoots, as much reflections of the instrument as they are of it, are elementally no different than steam and water: only their physics has changed. Thus, the spidery crawl space of “Close (For Comfort)” feels less like an introduction and more the extension of life cycles as yet unheard. Its throats sing to us in two further variations, each slightly more corroded than the last. Contrast this with the texture of “Surrender,” which with its amniotic undercurrents gives no indication of flaw. As the credits inform us, koto virtuoso Michiyo Yagi gave “Jukai (Sea Of Trees)” its title, an evocative one that carries the same double meaning in Japanese (樹海) as it does in English. Here, Aarset opts for the literal, painting with underwater gamelan a forest of internality. The level of development in its few short minutes is astounding, indicative of the thought put into the album as a whole. A subterranean bass tickles the soles of our feet in “Black Silence,” where slumbers a leviathan prayer. Its pizzicato veins chart every contour of our spines in “Active” and “Reactive” before spreading into the viscous pulchritude of “Homage To Greene.” Through a Taylor Deupree-like veil, Aarset weaves threads of guitar in a swaying rhythmic tide. If the foliage of “Jukai” could speak, it might sound like “The Whispering Forest,” which opens itself to concretely melodic shapes. Of the drone, we get only a teaser in “The Beauty Of Decay.” In the same way that the beginning was an end, so is this end a beginning. With a methodical sweep of the minute hand, it resets us to local time, that we might take this slow plunge into jet lag once again. An introverted biological excursion percolating through the crevices of reason? The fundamental opposition of oil and water made whole? A wired caterpillar turning painfully into butterfly? If images exist in answer to these questions, Evan Parker has drawn them throughout the massive intimacies of Memory/Vision. 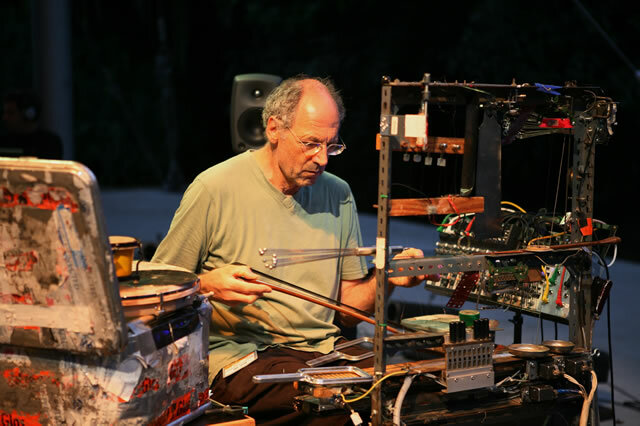 He and his Electro-Acoustic Ensemble have created a monster, and its name is “chronotopology.” The selfsame theory, invention of esoteric philosopher Charles Musès (1919-2000), sees the phenomenon of chronology as an effect of microscopic breaks in the space-time continuum. Relativity strings these breaks into beginning, middle, and end. In its attempt to embody chronotoplogy to the utmost, the EAE hurls ghosts of instruments—through real-time electronic manipulation—into the abyss exploded by violinist Philipp Wachsmann, pianist Agustí Fernández, bassist Barry Guy, percussionist Paul Lytton, and Parker himself on soprano saxophone. Dancing with a wide array of accoutrements, and aided by a first-class team of sound processors, this nonet dives headlong into the piano’s harp skeleton and resurfaces with the voice of a prophet in its teeth. One can draw points of contact between it and, for starters, the work of jgrzinich, George Crumb, and even later Heiner Goebbels. Yet rather than read into it, I propose that you let it read into you. What you hear is the voice of an un-caged bird looking for the past that flourished beyond its capture. The rush of water would sooth you in this dream were it not for the drought that veins the land with understated death. Suddenly, the piano turns upright and levels its paroxysms on a field of ebony and ivory. Reeds and bows balance on the edge of something free, coughing out the fulcrums of their revolution as stardust. Shades of recital bring their hummingbird thoughts to bear upon insectile realities. This is the corona of a storm that will never blossom and wither. A thistle of sound, prickly and rare. What you see is yourself falling down the rabbit hole, your fingers scratching glyphs into the dirt and roots that funnel you into oblivion. Each of these yields a navigable direction. The patter and movement of birds indicate a world beyond the beyond. What you feel is the sky growing cilia, tickling the borders of your skin and the biases it wears. Shifts of color and water link worm-hooks of possibility into recycled chains. What you taste is the mineral of your anxiety, the acid of expectation folding into spontaneous acceptance. Itself a form of improvisation, it splashes across the ornaments of your social life until they glisten anew. With them comes the flavor of experience, the privilege of assumptions made after the fact. What you smell is something burning from the inside out, singed bones crackling with transformation: the promise of embers condensed into charcoal and scribbled across the face of an unwound clock. Breathing in the haze of this cerebral (de)construction zone, you do not cough, but rather sleep for all the warmth that has embraced you. You’ve hit the ground. You’ve experienced all these things, have through them known the measure of your life. If the music treads above you, it’s because you are beneath it. If below, it’s because you aren’t low enough. Parker and company have thus accomplished the impossible: breathing out by breathing in.